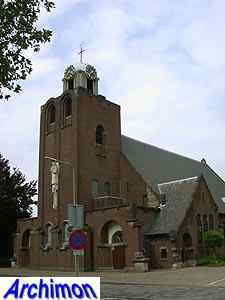 Frits Peutz was born in 1896 in Uithuizen (Gr) as the son of a catholic headmaster. To escape from the discrimination of catholics in the city of Groningen in 1910 he was sent to Rolduc (L) for his education. 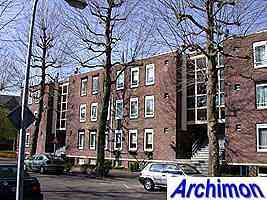 After his graduation in 1914 he went to the Technical University in Delft with the intention of becoming a civil engineer, but in 1916 he decided to become an architect instead. Although he was not graduated yet in 1919 he returned to Limburg and opened an office in Heerlen, in the heart of the mining district that offered many opportunities for young architects. In 1925 he finally finished his study. 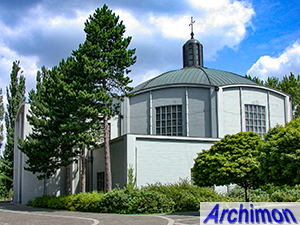 He became known for churches in a variety of more or less traditional styles, usually rooted in the traditions of his beloved province of Limburg, while in his profane work he turned out to be a true Modernist. 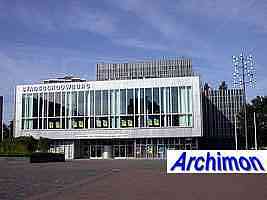 His most important work is the Schunck department-store in Heerlen, a revolutionary construction of glass and concrete. 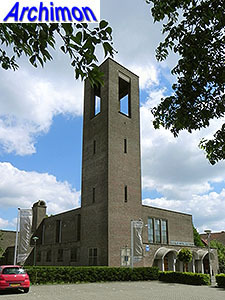 Peutz' use of two completely different styles and his aversion against, in his own words, the 'calvinistic-catholic dictatorship' of the Delft School in the 1930's made him controversial outside his province. Within Limburg he was much respected. During World War Two he wasn't allowed to work because of his refusal to join the nazi-controlled Kulturkammer ('chamber of culture'). After the war he restored several damaged churches, and also replaced several others. 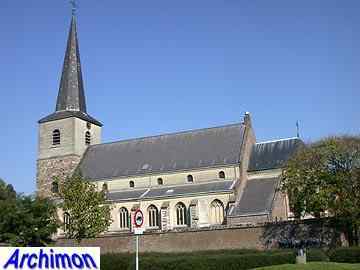 He continued his career until 1970 and died in Heerlen in 1974. 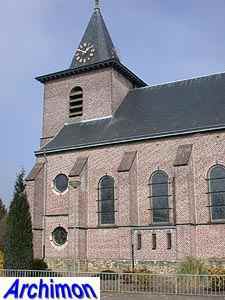 The following is a list of Peutz' work, both churches and profane. It is still incomplete. House for a (notaris). Porch with pillars at the front. 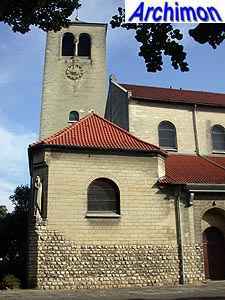 Peutz' first church, a building with Berlagian influences. House in a style that was probably influenced by the work of Dudok. Cruciform basilican church in a style inspired by Gothicism. Executed in marl. 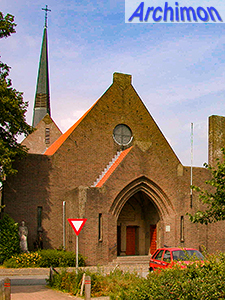 Church with three-aisles under one roof. Tower with saddle-roof. For the outside of the walls a local natural stone was used, for the interior marl. The choir is higher than the nave and has windows in its sides. School in a style that was probably influenced by the work of Dudok. 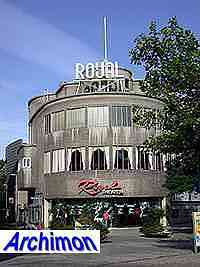 Department-store in Functionalist style, with a skeleton of concrete covered with glass walls. Better known under the name Glaspaleis. Small church in Traditionalistic Gothic-like style. 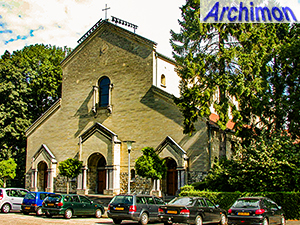 Church in Traditionalist style based on early christian churches, built of natural stone. Church in Traditionalist style built of natural stone. 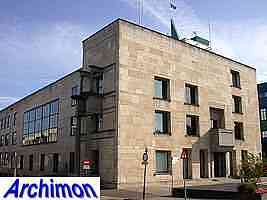 Town hall inspired by Classicism, with a front with pillars and a tympanum. 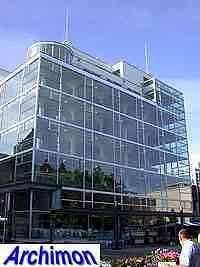 In the 1980's part of the building was replaced. Traditionalist basilica, executed in marl. 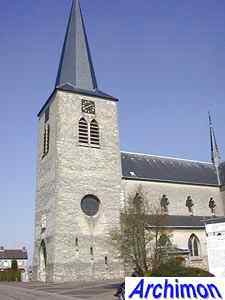 Peutz used the remains of the badly damaged church and archeological findings to reconstruct a Romanesque church. Square building with a large dome at the centre. 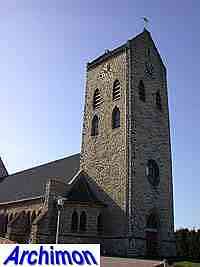 Of this old church only the tower was saved. 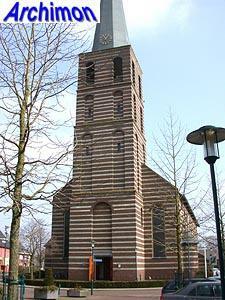 Peutz designed a new nave which, like the tower, is built in alternating layers of brick and natural stone. 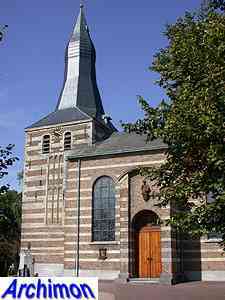 Hall-church in Traditionalist style, with a silhouet that resembles that of a medieval church. Alternating layers of brick and marl. Tall spire of reinforced concrete. Flat of three storeys high. Symmetrical building of brick, with horizontal accents. 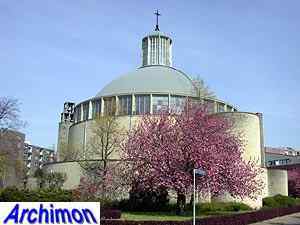 Dome-church of concrete, covered with marl. A porch was altered in 1997. New larger nave for older church. Three-aisled pseudo-basilica in Traditionalist style. 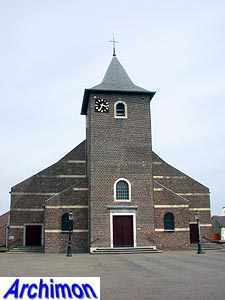 Peutz' last church. Three-aisled pseudo-basilica in Traditionalist style, incorporating an older tower.